You know when an outfit just makes you feel sassy? Like, you're walking round town knowing you look good like yassss. That's this outfit for me. I even mentioned this sassy af jacket in my SS17 trend: snake print blog post, and that was before I even opened the bloody parcel. If you follow me on Instagram you might remember just how excited I got when I opened my parcel from Missy Empire, which included this red biker jacket, striped pants and a white frilly top which you'll be seeing soon enough! If you've got a sharp eye, you might know that black, white and red is my favourite colour combination of all time. Obviously black and white are classic, but there's something about red's boldness that I love so much. I remember for my year 11 prom I had a red dress that my mum had made for me and insisted no one else in the entire year wear red (diva much?). Inevitably, two did, but I still looked cute. Just one point in my long, long journey of finding my favourite colours to wear. A lot of people say they're afraid of wearing red, but it actually makes me feel confident. If you know me, you'll know at first I'm actually quite a shy person (until you know me better and I'm dancing embarrassingly around you and giving you my best Tom Delonge impression) but when I put on something red to wear I feel like my outfit can do some of the talking for me. That's exactly how I felt in this outfit, walking around singing 'swish swish bish' as these pants floated about in the wind. Normally with such wide legged trousers, well, I say wide legged, they're more straight, but after years of growing up wearing skinny jeans, anything else seems wide legged, I'd wear something with a bit of height, like the platform sandals I shared in my gingham trend post, but for a day spent mostly on my feet I decided to put on my faithful vans, and you know what, I wasn't mad about it. I think it actually brought something a bit unexpected to the outfit in a way, despite literally everyone rocking a pair of vans old skools lately. 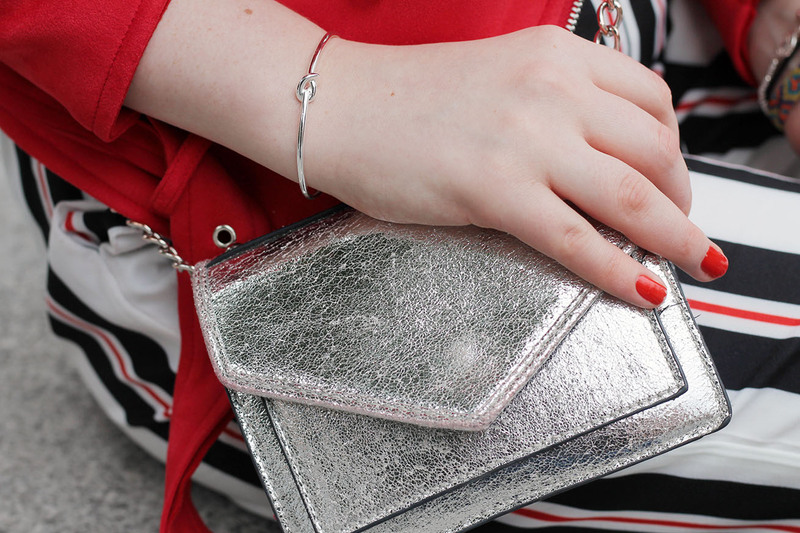 Seeing as the red biker jacket and bold striped pants did all the talking, I kept the rest of this outfit pretty simple with a plain black t-shirt and simple silver accessories. This dainty little knot bracelet was a gift from Stella & Dot, who recently held an event in Liverpool as they're looking to expand their brand in our beautiful city. I also got a pair of pastel sunglasses which will be coming out as soon as the sun returns, so make sure to keep an eye out on my Instagram for them! Do you have a certain colour palette you love to wear? What makes you feel confident? Let me know! 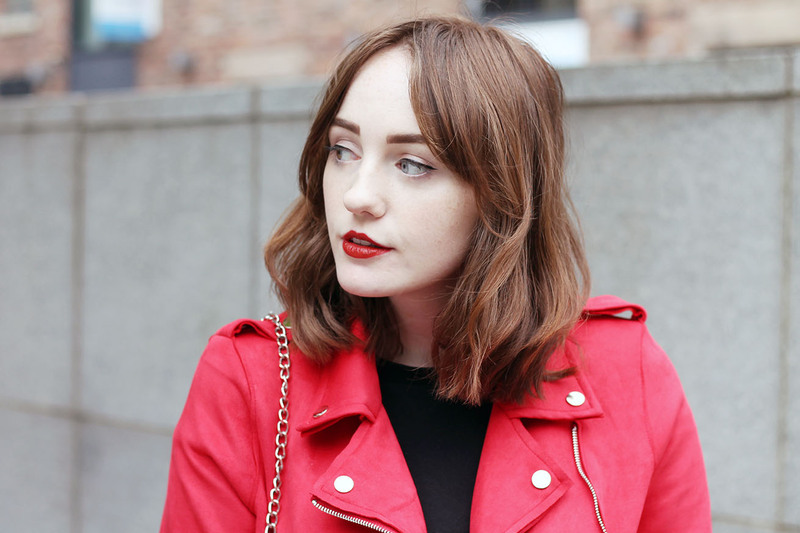 Follow my UK fashion blog on Bloglovin' for more fashion, beauty, lifestyle and travel posts.